Kishar - Fantastical live-action role play, combat, and adventure in an Arabian Nights-inspired setting. 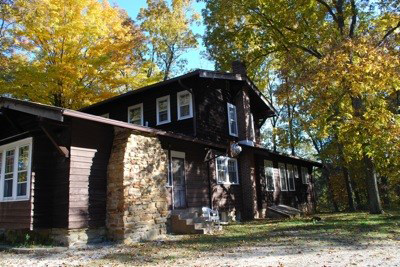 The Hickory Hill Retreat House is a large two-story house with 8 bedrooms and 12 beds. There are 5 full bathrooms and 2 half bathrooms. Most beds are twin-sized and one larger bed (double) is available. Rooms are private with one or two beds per room, power outlets and lighting, and many rooms have attached bathrooms. There is a large and well-equipped kitchen with two refrigerators, a microwave, a toaster over, an oven/range and griddle (sometimes needs cleaning), multiple sinks, and utensils, dishes, and cooking tools. There is also a dining room and large living room with fireplace. The A/C and heat are not perfect, but there are many fans available, and the shade and proximity to the woods helps to moderate temperature. The building itself is wheelchair accessible. Outdoors there is seating, a campfire circle, and ample trails, including access to a swimming pond. We will occasionally run into other hikers but otherwise the site is isolated and quiet amidst the rolling hills of southern Indiana. Staff does not generally stay on site overnight, freeing up all beds for players. Overflow sleeping options include couches, some floor space for sleeping bags and mattresses. Those who enjoy tent camping are encouraged to bring outside shelter for warm-weather months. Facilities on site are first-come, first-serve, but we ask that players to prioritize those with medical needs. Get on the Bypass (45) and head to the intersection with 10th street. Turn onto 10th Street / 45 headed East. Stay on 45 until you reach Trevlac (about 14 miles). In Trevlac, you will turn left (across railroad tracks) onto W Lower Bear Creek Rd. W Lower Bear Creek Rd will fork into 3 possible directions, turn left onto Bear Creek Rd. Continue down this about 2 miles until you reach the address (6933 Bear Creek Rd), at which point you should see a sign for Waycross. A Right arrow indicates "Hickory Hill/Youth Lodge". Turn right. At the fork, turn right again. Follow signs for the Retreat House. You will pass by a lake on your left. Keep going and turn right onto the road that takes you to the site. Continue up the gravel road. Parking at the top (by the Retreat House) is plentiful. Please try to park out of the way, and if possible, not block anyone in. Get on 465, heading for the bottom of the loop. (If you live downtown, get onto 135 S instead). Take the exit for IN 135 S, heading South. Stay on 135 for 26 miles. In Morgantown, turn left onto N Lick Creek Rd. Turn right onto Richards Rd. You will pass Waycross Conference Center and camp - the road becomes Bear Creek Rd. Bear left. When you reach the address (6933 Bear Creek Rd), you should see a sign for Waycross. An arrow indicates "Hickory Hill/Youth Lodge". Turn left. At the fork, turn right. Follow signs for the Retreat House. You will pass by a lake on your left. Keep going and turn right onto the road that takes you to the site. Get onto I 74 West. Take exit 132 (US 421 S towards Greensburg). Turn left and cross under I 74, onto US 421 S.
Take a right onto E Vandalia Rd. E Vandalia Rd becomes W Co Rd 240 NW (right turn). Take a left onto N County Rd 700 W, then an immediate right onto W Co Rd 200 N.
W Co Rd 200 N becomes E 1100 S.
E 1100 S becomes 252 when y ou cross N State Rd 9. Take a left at E 650 S.
Take a right onto State Hwy 31. Take a left onto 252. 252 merges with 135 in Trafalgar. Take a left onto 135. In Morgantown, 135 takes a left onto S Marion St. Follow it. Take a right onto Bloomington Pike, which quickly becomes N Lick Creek Rd. If coming from Bloomington, take IN 37 North. If coming from Indianapolis, Martinsville, etc., take IN 37 South. You will see a turn off for Morgan Monroe State Forest. The road is Pine Blvd. If you’re coming from the South, it will be on your right. If you’re coming from the North, it will be on your left. Turn onto Pine Blvd. Very shortly Pine will dead-end into Main Forest Rd / Old state Rd 37. Turn right onto Main Forest Road. You will come to an area where there is another fork in the road, and a triangular piece of land in the center of it. Turn left. This is also Forest Road. Continue for some distance on Forest Road until you come to a place where there is a shelter house on your right, a small parking lot on your left, and just ahead of you, a right turn (only) for Bean Blossom Rd. This shelter house (Wall's Shelterhouse) is our meeting place! The approximate address (according to Google) is 6245 Forest Road, Unionville, IN 47468. I don’t know how accurate that is, however, so following my directions should be the best bet.